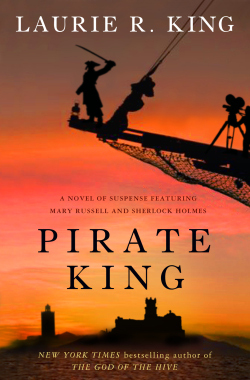 “Pirate King” is the latest in a series of mysteries set in the early 20th century and starring a detective named Mary Russell and her husband. You may have heard of her husband — his name is Sherlock Holmes. I’ve been a Holmes fan since I was thirteen, and I’ve read a lot of “non-canon” stories about him (written by someone other than Sir Arthur Conan Doyle), but none of them have presented the famous detective in all his complex allurement like these books by Laurie R. King. But unlike those other stories, these books don’t center on Sherlock Holmes — they center on his wife, Mary Russell. And before you throw arguments at me about Holmes being a lifelong bachelor, or a misogynist, or about Irene Adler being the only woman for him, let me assure you that these books deal with all those issues. Quite convincingly. But anyway, I’d better tell you what this particular book is about instead of nattering on about the series as a whole. Pirate King finds Mary Russell going undercover as an assistant for a silent film production of a movie that shares the book’s title. Scotland Yard thinks someone in the film company is selling guns and drugs, and they want Russell to find out who. Things sail merrily along until the entire film crew gets kidnapped by pirates. While Sherlock Holmes in absent from the first half of the book, he makes a welcome addition eventually. This is a bit of a departure from the usual tone of the series, being rather lighter than some of the more recent books, but it still has plenty of suspense and plot twists to keep a reader guessing. It’s also chock full of the period and location details Ms. King excels at, as well as lots of wonderful descriptions of making silent movies and traveling aboard a sailing ship. If you’ve never read any of this series, but love either Sherlock Holmes or just mysteries set in the not-too-distant past, I highly recommend these books. Start with The Beekeeper’s Apprentice and see what you think. Ms. King also has written a series about a modern-day detective, and several stand-alone novels, but I vastly prefer this series. In fact, it’s my favorite series by a living author!